Her name is Mother of Exiles. From her beacon-hand glows world-wide welcome. "Give me your tired, your poor, your huddled masses. Send these, the homeless, tempest-tost to me." America has lost its way. The strongest of people can be found in the unlikeliest of places. The future of the entire country will depend on them. All across the United States, people scramble to survive new, draconian policies that mark and track immigrants and their children (citizens or not) as their freedoms rapidly erode around them. For the "inked"—those whose immigration status has been permanently tattooed on their wrists—those famous words on the Statue of Liberty are starting to ring hollow. The tattoos have marked them for horrors they could not have imagined within US borders. As the nightmare unfolds before them, unforeseen alliances between the inked—like Mari, Meche, and Toño—and non-immigrants—Finn, Del, and Abbie—are formed, all in the desperate hope to confront it. 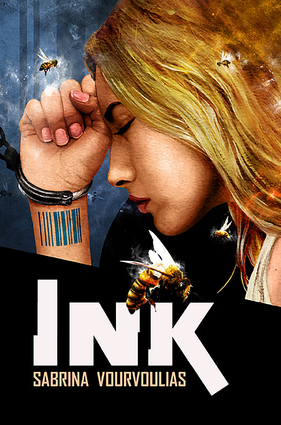 Ink is the story of their ingenuity. Of their resilience. Of their magic. A story of how the power of love and community out-survives even the grimmest times. Sabrina Vourvoulias is an award-winning Latina news editor, writer and digital storyteller. An American citizen from birth, she grew up in Guatemala during the armed internal conflict and moved to the United States when she was 15. Her news stories have been published at The Guardian US, Philly.com, Public Radio International's Global Voices, NBC10/Telemundo62, Philadelphia Weekly, Philadelphia Magazine, City and State PA, and Al Día News, among others. Her short fiction has been published by Tor.com, Strange Horizons and Uncanny, GUD, and Crossed Genres magazines. She lives in Pennsylvania with her husband and daughter. Read more at www.sabrinavourvoulias.com, and follow her on Twitter @followthelede. Kathleen Alcalá is an award-winning author of six books of fiction and non-fiction, including Deepest Roots and Spirits of the Ordinary. She received her second Artist Trust Fellowship in 2008, and was honored by the national Latino writers group, Con Tinta, at the Associated Writing Programs Conference in 2014. Kathleen has been both a student and instructor in the Clarion West Science Fiction Workshop. Until recently, Kathleen was a fiction instructor at the Northwest Institute of Literary Arts on Whidbey Island. She now lectures for Antioch University, and an instructor at the Bainbridge Artisan Resouce Network .